First shipment of current crop Ethiopia has arrived! A lot has been happening in Ethiopia last year, for us, and in politics. Politically, the turmoil has caused some concerns and insecurity across the coffee industry about effects on availability of coffee and access to coffees from Ethiopia. In our own news we have an established office and lab space that has been fully operational throughout this season, this has given us an ability to function on a much broader scale in our efforts to find coffees that are cupping great and show a good range of what can be produced in Ethiopia. It has also facilitated building relationships with new suppliers and stronger relationships with our existing partners. We are happy to report that there are both fantastic coffees available and accessible this year, the cup quality in the South has been consistently high. Our first container has arrived and the coffees have already been running out of the warehouse! We cannot speak in detail about the past years political unfolding within Ethiopia, but we were concerned that there could be difficulties in production that could have affected the quality or the volume that Ethiopia could produce. Fortunately this is not the case. It is very clear at this stage in the harvest where we have cupped through much of the coffees and made selections, that the volume of production is high and the level of cup quality we are seeing is unaffected by the events of last year. There have been some political changes, the Ethiopian cabinet has undergone some changes and this has lead to a new minister of Agriculture. It has been a stated that there will be major reform in the coffee industry and have proclaimed new laws will be implemented, the most notable for us is that suppliers will be allowed to export the bean directly to the international market rather than being confined to the trade floor. This will have a positive impact on the relationships we have already been developing, and will affect change in the production of coffee. Previously privately owned washing stations had no other market for their coffee but the ECX, so they had no benefit of investing in the quality of their production, only in volume to see direct returns on their investment. Under the new stated laws an investment in processing coffee to a high standard can be realised directly by the washing station making the investment. The changes also suggest that there will be limitations on issuing of licences, and stricter applications of the laws required to maintain one’s licence to export coffee. This will serve to ensure that the industry maintains some standards of operating. The production forecast for Ethiopia this season is 390,500 tons or 6.508 million bags. Although our volumes cannot be compared, Ethiopia is the country we buy the most coffee from and gaining a broad perspective of the whole production for each season is what enables us to make better, more informed buying decisions on the volumes of coffee we do buy. The lab in Addis and having permanent staff in Addis is a major part of this, we are able to do work at the beginning of the season to cup through early samples taken when we are visiting private washing stations, farms and Co-operatives that we work with. 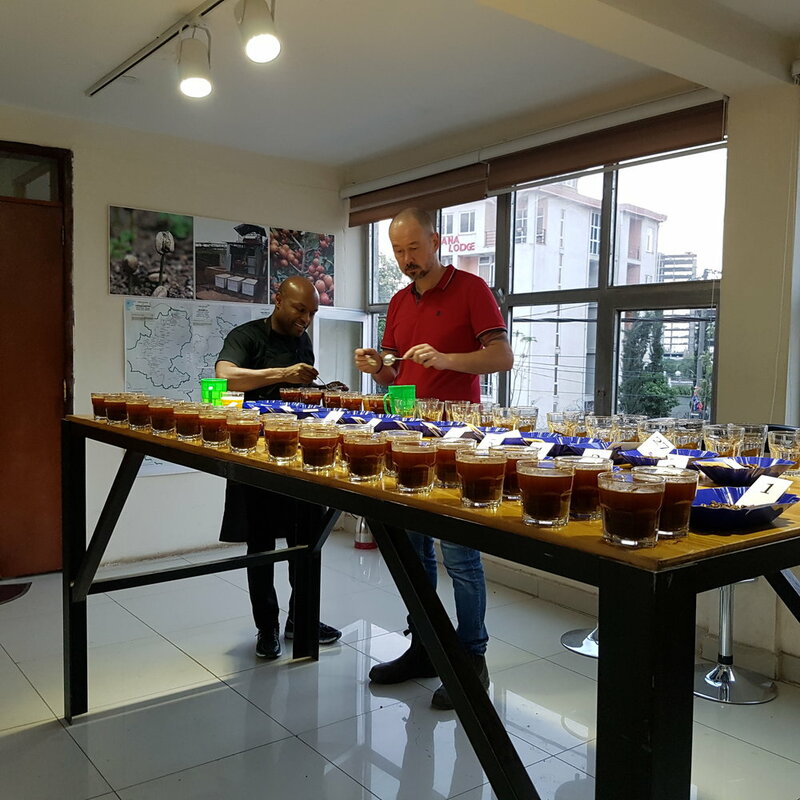 Cupping through these samples, when we know the cup qualities are not as well developed as they will be later on in the peak of the season, will give us insight into what’s to come. We will also start to be able to gauge what kind of volume is being processed at the various stages of the season, and so can estimate what kind of production year it will be. We have also found huge value in being face to face with our partners in Ethiopia throughout the entire season. This has meant we get to have very honest conversations about what’s working and what’s not when we are perusing different projects, and how to better support the needs of suppliers. This year, as our first fully operational year we already see the value that has been added and we are sure you will too when you taste the coffees we have coming in! They are already here! At the time of writing we have three lots available on our offer-list. We have a stream of coffees coming, the first of which landed the first week of April. At the moment the landed coffees are all washed but we have some great naturals that will start arriving in May/June. Please feel free to email us at coffee@nordicapproac.no with any questions about our Ethiopian coffees. …And if you’re looking for an absolute bargain, we reduced all of our remaining last year’s Ethiopians to ridiculously low prices.